José Mourinho has warned that he could complicate any attempt by Arsenal to take Petr Cech to the Emirates by insisting that Arsène Wenger send a player to Stamford Bridge in return. 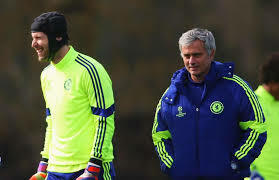 Mourinho accepts that his employer, Roman Abramovich, can grant Cech permission to move to any club the goalkeeper wishes as a reward for a decade of service at Chelsea – and Cech this week hinted at a preference for Arsenal by intimating he would like to remain in London – but the manager added with a mischievous smile that he could still add a twist to any deal that Arsenal hope to do. Mourinho added that he aims to recruit three players this summer to ensure his Premier League-winning team do not lose their appetite. He also expressed his satisfaction that none of his key men are likely to leave. “I think [the most important business] is done, which is to keep the players I want to keep. In other seasons I was very happy to sell a few players, even good players. This season I’m not happy to sell my best players so that is the real challenge to keep them.